At the Shores Deaf Church, SignWriting is an integral part of our mission. Presently we use SignWriting in almost every area of our ministry. Every Sunday we use SignWriting to project our Scripture text for the day and volunteers read the signs. Often we give prizes out to the best readers. All our pass-out papers include SignWriting. 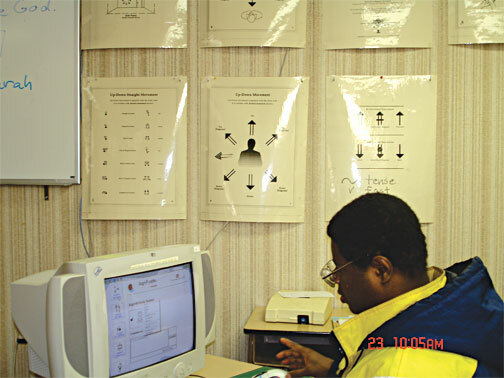 Photo Above: Arthur, a Deaf congregation member, uses the SignPuddle program on the web to find English words, and to read the equivalent translation in American Sign Language, written in SignWriting. In our classes, we teach people how to read scripture in SignWriting, how to write the signs, and we teach English glosses so that eventually students can use SignPuddle. 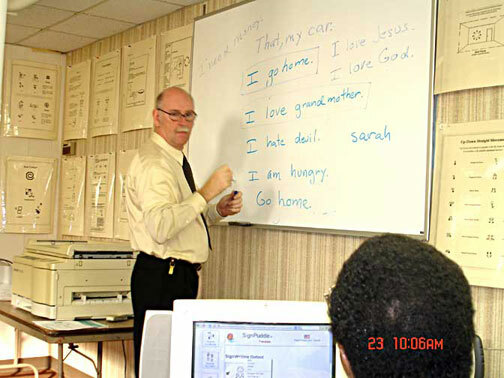 Photo above: Reverend Dettloff at the board, is teaching Bible passages in English, while a Deaf student at the computer uses the SignPuddle program on the web to find the translation of the words from English into American Sign Language written in SignWriting. For some Deaf students, this is the first time they have been able to read Bible passages. Our congregation consists of Deaf people with different levels of education. Those Deaf people who are college educated have opened up their minds to the possibilities of SignWriting, and have allowed me to use it on every level, especially for those Deaf members who do not read and write English well. Around a third of the congregation has some trouble reading the Bible in English. For them, SignWriting is a blessing. We have a special class in which we use SignWriting to teach students how to read the Bible in English. We use SignWriting first and then we move over to English. We have had great success with this, especially with students considered illiterate or low functioning. In fact, I believe a system of writing that does not require a college degree is a much more useful system. We find it much easier to teach the Bible when we do not have to teach English first. We are currently praying that God will supply us with some helpers in our translating of the Bible into SignWriting. Anyone considering assisting us in this worthy project must meet the following requirements: Born again Christian, knowledge of Scripture and Christian Theology, formal training in ASL and English, and a love for the Deaf. We will teach you SignWriting. About the Author: Reverend Ronald H. Dettloff is an ordained minister with the Assemblies of God and has worked full time in Deaf ministry since 1987. He has earned degrees from Central Bible College, Macomb Community College, and has also earned a certificate in Sign Language Studies from Madonna University. Currently, he is working on translating the entire Bible into SignWriting.